2011 is upon us, and the New Year will find painful mornings at the gym, empty shelves in the diet section of booksellers, and a renewed commitment to activities that bring purpose and happiness. At least, for a while. What are your New Year’s Resolutions—save money, quit smoking? People are trying to cash in by helping you keep them. There are even new apps for your phone designed to keep you on the path to self improvement: NikeCouch to 5k (C25K), Mint (you guessed it—save cash! ), and lastly—LeadMyGoals. The motto “there’s an app for that” aside, how does one successfully accomplish and keep New Year’s Resolutions? Is it worth it? A recent article in the Wall Street Journal makes a startling claim: forget willpower, reaching a goal means retraining the brain to form new habits. Willpower originates in the prefrontal cortex. When this cognitive and decision making area of the brain becomes overloaded by other life events, which will inevitably happen, classic overload responses kick in—and the instant gratification of chocolate and potato chips is too much to pass up. Mental stress leads to the desire for instant gratification. In other words: wave goodbye to the healthy lifestyle resolutions when relying on willpower. So the way to keep resolutions is not willpower, then what is it? Well, it is about making resolutions and life more meaningful, focusing on positive emotional reinforcing rewards and realistic planning for the “journey.” So, forget the old addeage “the end justifies the means” – it’s about the means, the process of how to reach the resolution. Behavioral psychology recommends making detailed plans (with an emphasis on reasonableness and time considerations), emotional rewards, linking new habits to pleasant desired changes, positive reinforcements, anticipating setbacks and reactions to them, and lastly—increasing self control prior to plan implementation. Could it be that our general inner emptiness, lack of purpose and meaning in our lives, lends itself to a helplessness and inability to effectively change particular aspects of our lives? Do many people simply possess an inner conviction that they have no ability to direct their own life, resulting in an augmented experience of existential emptiness? So, what is the solution? 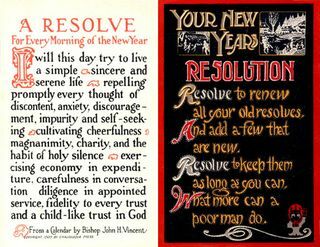 How can we accomplish resolutions, both behaviorally and existentially, in a lasting way that gives meaning and purpose? Victor Frankl in Man’s Search for Meaning, suggests implementing three strategies– stemming from logotherapy. 1.) Create a work or do a deed that has personal significance and relevance. 2.) Experience something or someone that enlightens and rekindles inner and external hope. Essentially, meaning is found in both work and love. 3.) Embrace a tragic optimism. Meaning is available in spite of, through, and outside of suffering. Thus, work toward “creatively” changing one’s life by rising above, growing beyond; thus changing oneself. In light of behaviorism and existentialism, maybe this year your new year’s resolutions will stick. And more, maybe with the help of existentialism, you may find meaning, purpose and direction in 2011 and beyond.